Regular readers of this humble blog may remember the chocolate-laden, gluten free post I re-blogged last week from fellow foodie writer Sophie James, who writes a very elegant blog called Stories from the Stove. Of course, that’s where the similarity ends, because mine is. . .less elegantly written. But that’s OK, I get my point across, and that’s a nice gluten-free cake she’s got there. I’m going to tell you about another chocolate cake in a minute, and the story that’s attached. In a minute. Because, it was my BIRTHDAY. This week marks a number of starts. First, I have switched phone companies and now have an iPhone 4s. I really didn’t want a Smartphone, because I see how dumb it makes people. But I was missing too much important email; people and companies assume everyone has one, so it became a necessity. I’ve loaded it up with lots of cool apps, including one from east coast grocery chain Publix, which includes a nice grocery list function. It’s free and really handy, although it can be a little fussy. And you don’t have to go to Publix to use it! My local HEB used to have a similar thing on their website, but not anymore—and the only apps HEB has are all for HEB Mexico.) There are a number of free grocery list apps available for the iPhone, but I’ve been using the Publix grocery list for a couple of years on the PC, so I decided to stick with that one. Once in a while, I actually make a real, live phone call with my iPhone. Go figure! I also take comfort in the fact that people who are considered geniuses have very messy desks. That’s why you’re not seeing pictures of mine. Ever. Also this week for my music fans, Def Leppard’s CD/DVD set of their Viva Hysteria concerts in Las Vegas earlier this year was released this week. If you buy it from Amazon, they also have something called “AutoRip” where you can download the audio for free, right away, and import it directly into iTunes before your hard copy arrives. Mostly I want to see the concert video, since I couldn’t get to Vegas to see these five handsome UK males (and they didn’t come to Houston this year) so that will be next week. I also have their previous live CD Mirrorball, and kept up with their shows on Facebook, so I kind of know what to expect. If you’re a fan—and yes, I am—you can read more on DefLeppard.com. Yeah, I know, it’s not foodie related. But it’s new. And it’s Def Leppard. RAOW. The current diet phase is over, and I’ve lost ten pounds. Woo hoo! Should have been more, I tell myself, but if you don’t sleep 8 hours or so a night, and you sneak some chocolate now and again, you won’t lose as much weight. I know this because I’ve seen it myself on the daily diet charts. On the mornings where I slept less than 6 or 7 hours, I either stall or gain a bit. When I sleep enough and more or less follow the program, I drop it. Mostly I sleep in on the weekends, because there is too much to do when I get home at night. My evening task lists always start with, “feed cat. Feed big cat.” You can guess which one is the big cat. I also ordered a case of 12 cans of Somersweet two weeks ago to stock up for a while. There was a free gift with purchase, travel sizes of some of her exclusive toxin-free hair care products. The day the box arrived, I got an email from SS’s website telling me that “Somersweet is 25% off!” Had I waited a week, I would have saved about $22.50. AAAAHHH!!! But that’s kind of the way my luck goes sometimes; I didn’t know that was coming. Darnit. Last week was the annual Bootcamp for American Writers & Artists, Inc. (AWAI), where I’ve been for the last three years, twice on my birthday. Unfortunately, I couldn’t make it this year, but will try again next year. It’s like missing the family reunion to me, but I wasn’t able to go for a handful of reasons. Keep your fingers crossed for next year. Last year they not only baked my cake, I also had 325 copywriters sing me Happy Birthday. This year, I’m on my own. But that’s OK too. It was also at last year’s Bootcamp that my friend Akinnyi from London, a very nice man, said to me, “well, why don’t you write a food blog?” On the way home, the ideas started to gel, and I got on WordPress a few days later. In fact, when I logged on tonight to start this blog post, WordPress had a message for me: Happy Anniversary! It was one year ago, October 29th, that I started this blog. Foodies have been rolling their eyes ever since. Including Sophie James, I bet. This one’s for you, Akinnyi. Thanks for the idea. I ran with it. Since I didn’t go to Bootcamp this year, I had to bake my own birthday cake. I already knew which one it would be, because I baked it many times before. 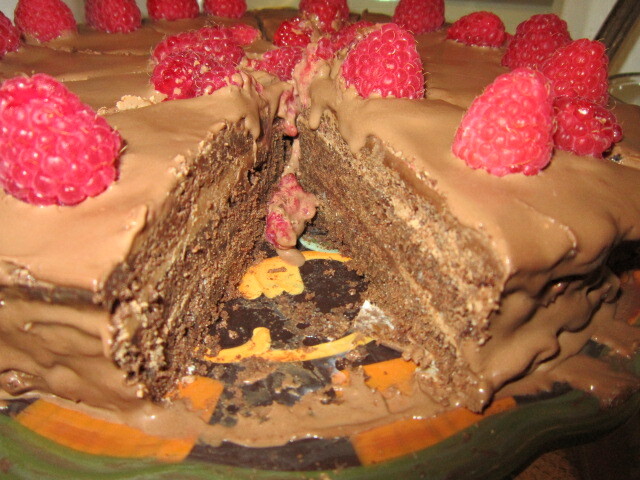 It’s the Chocolate Ganache Cake from Suzanne Somers’ original 2002 Desserts book, incorporating her newly released Somersweet in to the recipes so that delicious desserts were available to make and not give you sugar crashes or toxins from aspartame. It was a while before I tried Somersweet, but eventually I was won over, and I still buy it today, in it’s updated form. So this cake is, indeed, gluten free, because there is absolutely no flour of any kind, no sugar, and made from basic ingredients (and Somersweet). But since Suzanne Somers Desserts was published in 2002, most people hadn’t heard the term “gluten free” unless they were suffering with celiac disease or some other reaction from wheat. In this book, it’s considered “low carb,” because that’s primarily what SS’s books were about. Sugar manifests in many forms, wheat included, since most carbs turn to sugar in your bloodstream. That sugar then stimulates the insulin response, and that’s where things can go awry, particularly with continued intake of sugar. You may not realize this is happening until your doctor starts talking about “options for managing your diabetes.” I know this because my Dad continually ate what he was told by his doctors that would “improve his heart health,” only to later find out the hard way that none of it was true. Didn’t help his heart and didn’t prevent diabetes. Anyway, enough of the Wheat Belly lecture. This book was published just after Somersweet first came out in 2001, and the entire book, plus another called Chocolate, are all healthier versions of various desserts (although some may have small amounts of sugar for the times you can handle it.) 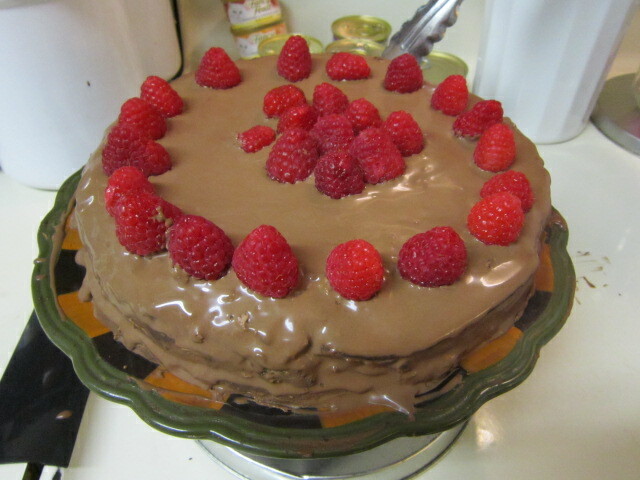 This particular cake calls for a small amount, since the original Somersweet was 5x sweeter than regular sugar. 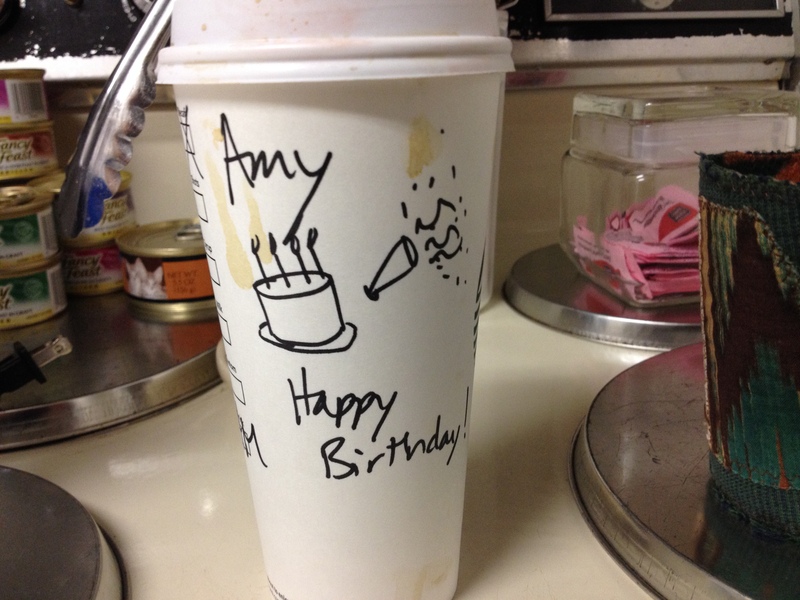 Today, Somersweet is cup for cup like sugar, so I did a little reconfiguring to make it come out right. 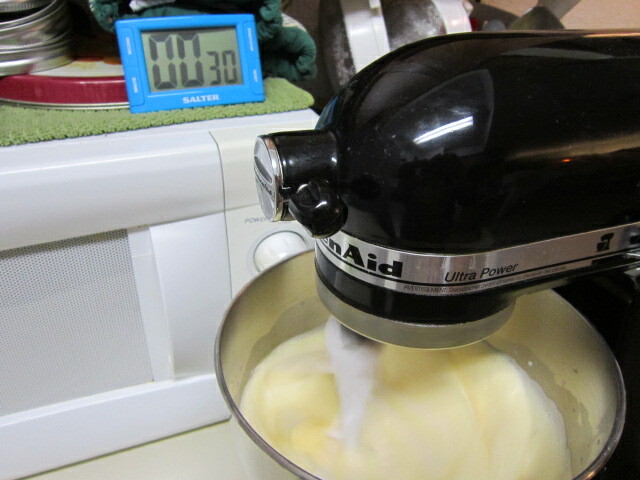 The actual cake part is made by beating 8 eggs for several minutes with some baking soda and getting so much air into them that they bake up and come out baked as a cake. I haven’t made this one in 3 years, but it’s pretty simple to make, and works every time. This is an extremely delicate matter, because one wrong move and the whole thing falls apart. 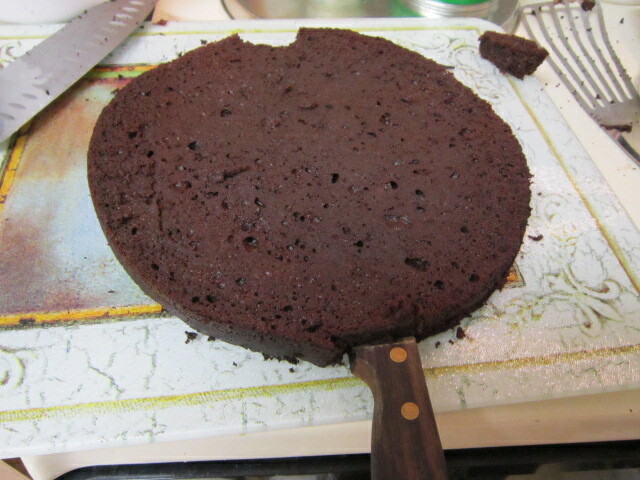 It’s heavy and dense, so you have to have a big spatula or two to move the bottom over to the cake plate. A trick I learned from the Barefoot Contessa recently is to put a small dollop of buttercream under the bottom layer so the cake sticks to the cake plate. I did that, and later regretted it when I put squares of wax paper underneath so I could make it without a mess. Uh, right. . .
See the wax paper squares? 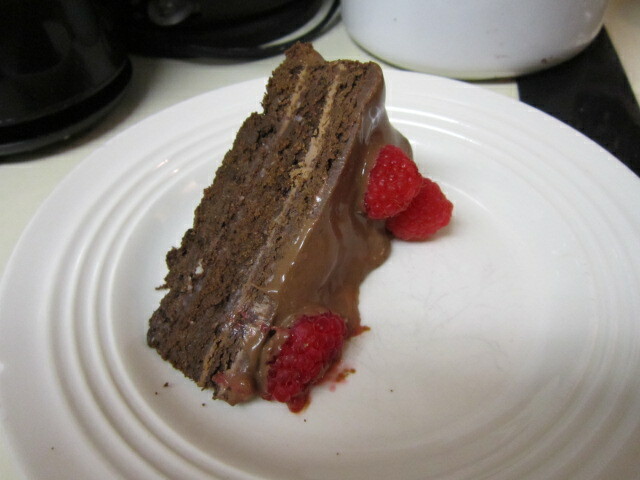 That was intended to keep the ganache from dripping all down the shelves of my fridge. 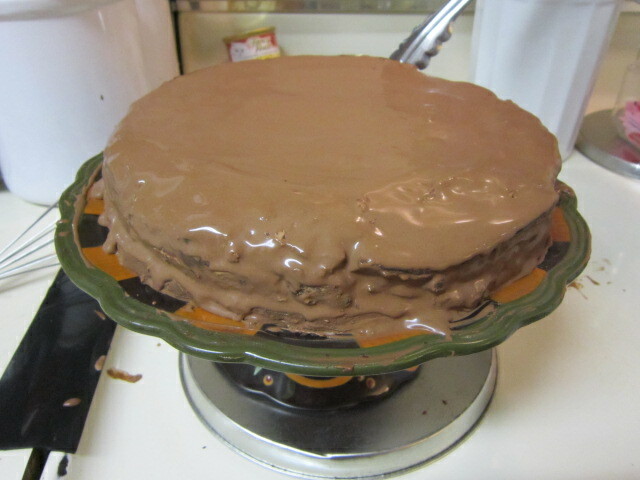 Unfortunately, it not only facilitated dripping chocolate, it made the ganache drip outside the confines of the baking pan I put the cake plate to to contain the mess. 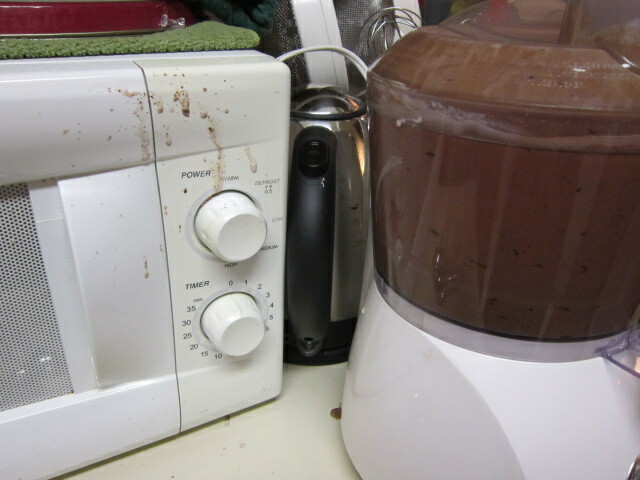 So it made a bigger mess than it was designed to contain. It figures. That’s what’s known as irony, if you didn’t know that before. 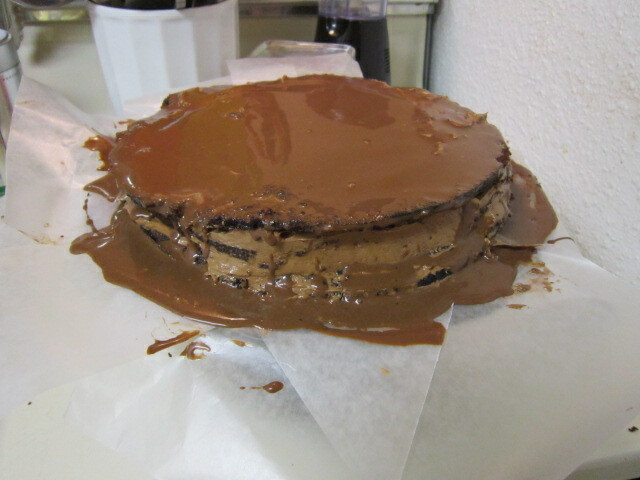 After that last picture, I stuck the whole thing, plus the dishes of buttercream and ganache, in the fridge to chill and thicken up a bit, hence the drips on the top shelf. 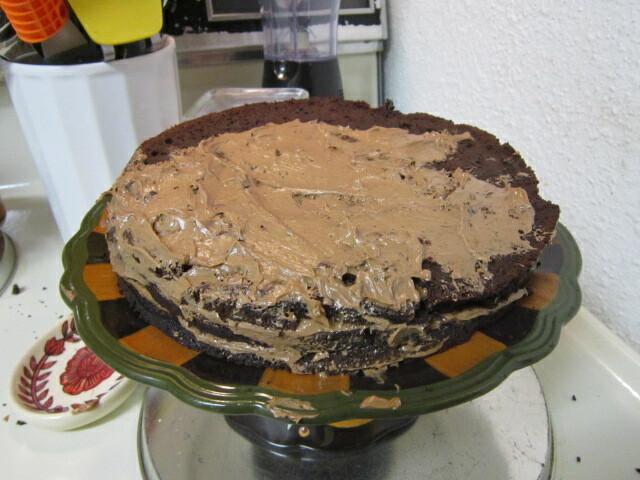 This cake recipe includes a rich chocolate buttercream filling and a very nice ganache that is poured over the whole cake. Trust me when I tell you that I do not waste a drop of it. 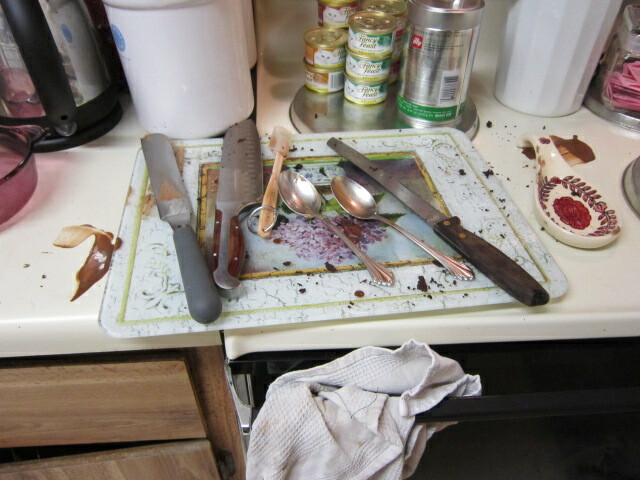 One of the benefits of being in your own kitchen is that YOU get to lick the beaters. If you have kids around, then you have to bake when they’re not around or are otherwise occupied. 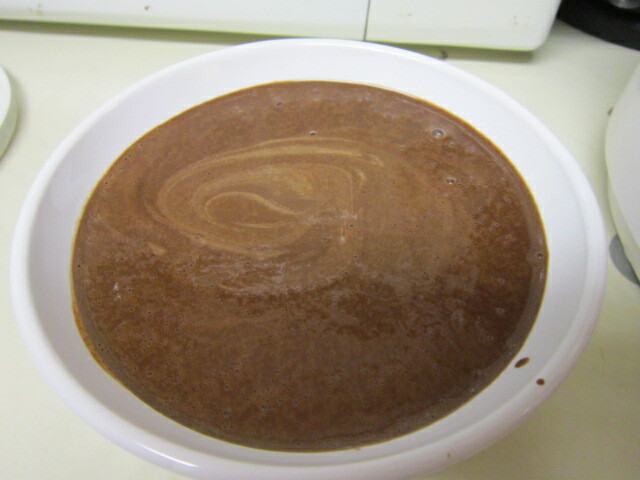 Simple chocolate ganache. Yes, thank you. 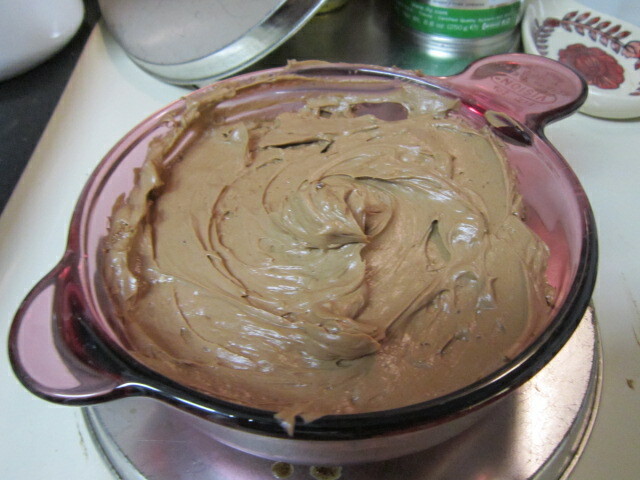 Chocolate Buttercream. Is there anything more perfect? In the end, it all worked, and while it doesn’t look quite the same as the picture in the book, it’s pretty tasty looking. I picked up some raspberries at Kroger, and decided to up the ante a bit, because, well, I love raspberries with chocolate to begin with. Just a little something extra to make it all mine! Four years ago I also bought that ceramic cake plate because putting it on a dinner plate wasn’t working. 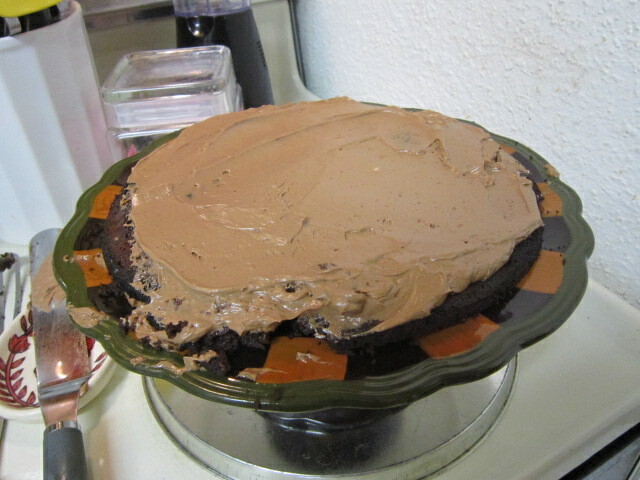 Of course, on this one it’s a bit, um, earthy, so the chocolate doesn’t exactly stand out. DUH. But that’s what was available at Hobby Lobby the day I went over there. 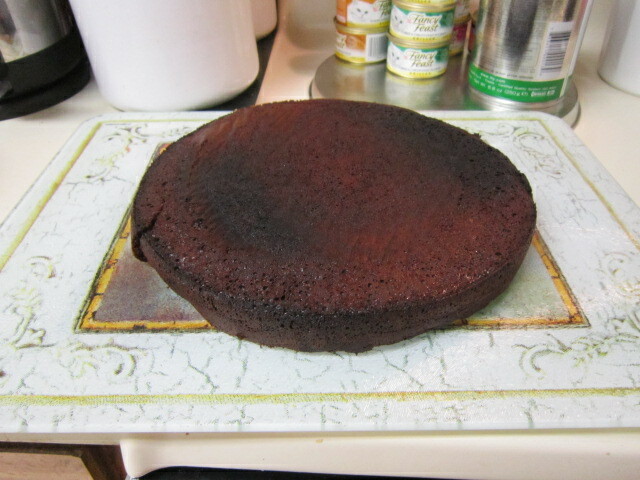 It has been collecting dust, because I’ve gone to Bootcamp the last three years and didn’t bake my own cake. Rich. Thick. Chocolate. Any questions? OK, OK, so I flopped it on its side. It’s edible. I did share with one of my neighbors and one of my Buddhist friends I visited the next morning. I would have shared with two of my neighbors, but the other one had surgery around her mouth and can’t chew. She got some delicious Tuscan White Bean and Garlic Soup. She didn’t want all of it, so naturally, I ate the rest this week. I gotta make me some more of that soup soon–it’s so good, and takes just about 20 minutes. OK, so there’s the seasonal fruit cup off-camera that was 49 cents, and then the blueberries for the oatmeal was another 49 cents, and one more thing, I think, for a total of $1.61. 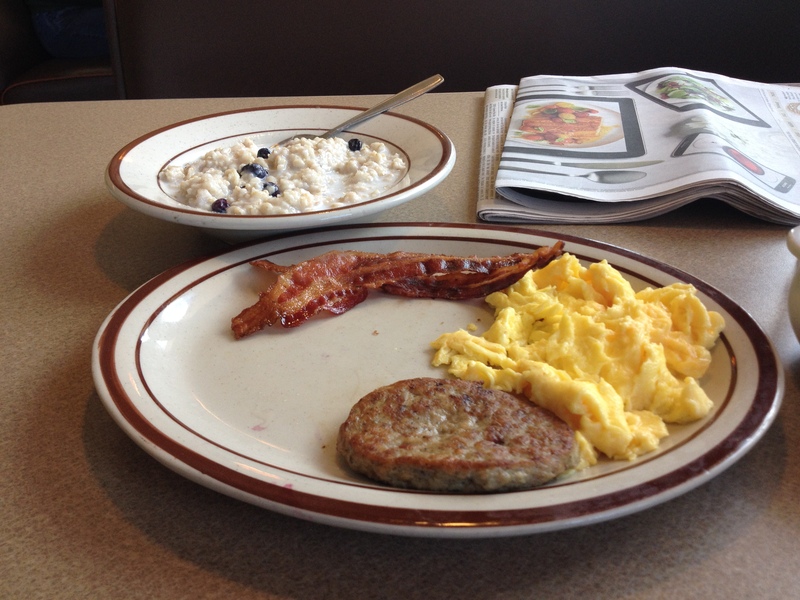 Maybe it was the milk for the oatmeal; but still, it was pretty darn good. 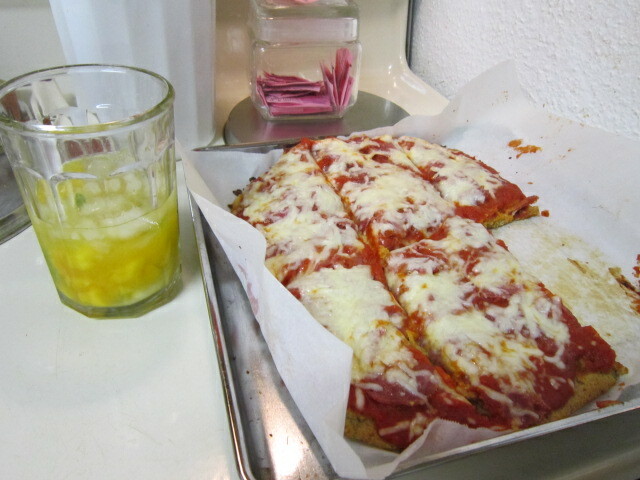 Now for dinner, I decided on pizza–home made, gluten free pizza. I took out the Wheat Belly Cookbook and got to work. However, I also used a canned pizza sauce without sugar in it, as well as some delish sausages bought on sale at Cost Plus World Market. (Because it was my birthday, I had a $10 off coupon, plus they allowed me to use a 10% off purchase coupon I got in the mail. Cool!) Not bad, not bad, and I had plenty left for breakfast. Overall, it was a pretty good day, and I even got a new shirt nearly completed too. The weather was good, the sun was out, the sky was a beautiful blue, and fortunately, everything was pretty good. Sunday brought an old friend for dinner, and he was wowed with not only the cake but a delicious salad from Giada de Laurentiis and one of Nigella’s delicious dishes from her last book. More on that later. Of course Monday came along, and I now live for next weekend, where I am promising myself I will not drive anywhere for anything and stay home for 48 hours. I hope so.